In no order of importance. They are all just as important as the other. Sleep is the often neglected one. It doesn't just mean sleeping enough, it also means not oversleeping, and getting good quality sleep as well. Sleep is probably the trickiest and hardest to maintain, and may be heavily related to stress which I will touch upon in a little bit. A good book on sleep is called Dreamland: Adventures In The Strange Science Of Sleep. I often tell people, if you're going to be "bad" as you say, then at least sleep well if you are not eating well or exercising. Or at least exercise if you are not eating or sleeping well. 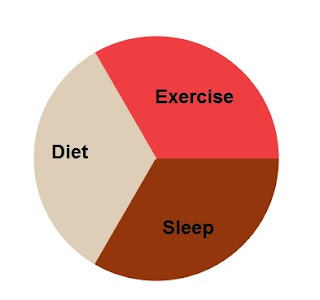 Or at least eat well if you are not sleeping well or exercising. Do at least 1 of the 3, don't give up on all your Lifelines. What's the point of giving up on all 3 when doing at least 1 of these things isn't that much harder than doing none of them? And you will be exponentially better off for it. But I like to people to go further. Always try to at least maintain 2 out of the 3. If you aren't going to work out, at least sleep and eat well. If you are not sleeping well or you are staying up late a lot, eat well and exercise often. Or if you are not going to eat well, at least work out like crazy and sleep in early. You will find that if you consistently do 2 out of the 3, the 3rd aspect will fall into place. For example eating well and exercising may help with your sleep. Or sleeping early and exercising may make you crave less bad foods. Or eating well and sleeping well may give you more energy to be active! Often times people get stuck in "plateaus" or aren't progressing at the speed they would like. But are all 3 Lifelines firing on all cylinders? Maybe there is one or more, or possibly all three that needs optimizing. A person who doesn't do any of the 3 will not get as good of a result as a person who does 1 of the 3, and a person who does 2 of the 3 may get better results than a person who does 1 of the 3. And if your stuck at the same place, maybe its time to make sure you are good on 3 out of the 3. An important thing I haven't mentioned is also stress management. But all 3 Lifelines affect your stress management ability, and stress management is something people have to deal with 24 hours a day 7 days a week. It's not something you do once a day or several times a day like eating, but its something you are consistently doing, a habit you form. So I cannot stress good stress management skills enough, whether its through visualization, meditation, nature walks, breathing exercising, martial arts, yoga, prayer, or just plain being positive all the time, it is the lubricant that will help maintain all your Lifelines. Nothing I am saying is a new idea, but when it's written out like this, people can often times see how silly they have been or easy it is to at least maintain some form of discipline than giving up on everything. You always have to trick your own mind to doing what you need it to do. Not accounting for your ability to fail is like preparing for failure.